After “Bonfire” I waited for, what seemed like forever, to read Wolfe’s next novel and to my delight it centered on an Atlanta real estate developer. It was a book I would recommend to real estate loan officers who worked for me. Of course his usual shoe leather wasn’t used for this expose. Ironically, he skewers Charles Darwin and Noam Chomsky for their lack of fieldwork in taking the quantum leap in theorizing just how humans developed what makes them the invincible top of the food chain. Darwin believed language had somehow evolved from animal sounds and was constantly criticized by Max Muller, who described Darwin’s theories in baby-talk terms. Wolfe wonders if Darwin’s theory was his at all. Maybe he stole it from Alfred Russel Wallace, a nobody. 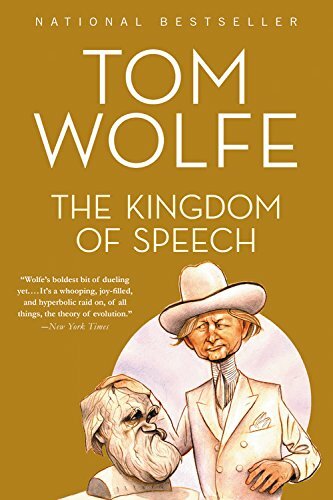 Speech has allowed humans “to conquer every square inch of land in the world, subjugate every creature big enough to lay eyes on, and eat up half the population of the sea,” writes Wolfe. Everything humans do is enabled by speech, from the creation of religions to the taking of one’s own life. Wolfe, in full white suit and tie dress went to work by 10:00 am each day with a writing quota of 1,200 words (ten triple-spaced pages as he puts it). It might take a couple hours or well into the night. I think Wolfe’s daughter was on to something, and her dad artfully dodged the question.